An ongoing debate on whether to send a robotic mission to Saturn's moon Titan or Jupiter's Europa may be settled later this week. Both are difficult places to get to, and both have become alluring targets in the quest to learn whether Earth alone supports life. An upcoming meeting between NASA's lead scientist Ed Weiler and his European Space Agency counterpart David Southwood is expected to resolve the issue. A mission to explore Europa, which is believed to have liquid oceans beneath its frozen crust, likely would include a second spacecraft, built by Europe, riding piggyback. The European spacecraft would be dispatched for an independent mission to Ganymede, Jupiter's largest moon and one which also may have an ice-capped ocean. 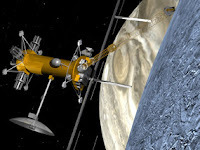 The joint NASA-ESA Europa Jupiter System Mission also could include a lander provided by Russia, which is hosting a meeting this week to discuss technologies to probe the moon's subsurface oceans and assess conditions for life. "We'll see if they're really serious about building this thing," says astrobiologist Dr Kevin Hand, of NASA's Jet Propulsion Laboratory. "Much of the reason why I'm here, and my other NASA colleagues are here, is to see what's on their agenda and to see how they are interested in moving forward with that agenda," says Hand, who is attending the European Lander Science Goals and Experiments Workshop conference hosted by the Space Research Institute in Moscow. "There's a lot of great science if you could get to the surface," says Dr Dave Senske, a JPL planetary scientist who led a NASA study team assessing Jupiter mission options. With or without Russian participation, NASA and ESA plan to collaborate on a major initiative to the outer planets that would launch around 2020 and have a transit time of about six years. A mission to either Titan or Europa would cost between US$2 billion and US$3 billion. In the meantime, missions to Mars - a six-month voyage that can take place every two years - will continue, though perhaps at a more modest clip. NASA recently passed up an opportunity to launch the Mars Science Laboratory this year because of technical concerns. "Mars is closer and easier to get to," says JPL planetary scientist Dr Brad Dalton. "There's a lot going on in our own solar system and a lot of chances to still find the possibility of life." Looking beyond Mars and Jupiter, Titan has two enticing features in the search for life. It has liquids on the surface, and a thick atmosphere that can be used to slow down a spacecraft and help put it into orbit. The surface liquids, however, are believed to be mostly methane, which is not as conducive to life as liquid water. Titan's surface water is locked into the crust as ice, but scientists suspect there may be a subsurface ocean where water mingles with ammonia. Europa is thought to have subsurface oceans with rocky bottoms, which, on Earth at least, are a source of life-supporting chemistry. Scientists would like to scan the moon's surface for bits of material that may have seeped up from beneath the ice. "Imagine if there were microbes entrained in material that has exuded onto the surface of Europa...and they've been sitting there for maybe three million years," says Dalton, an expert in infrared spectroscopy. "If we could drop a lander and sample that stuff that would be very exciting." NASA's blueprints for a Europa orbiter include room for a small lander. "The community wants to land, they want to get down on the surface...but in terms of the expense of the mission, we just weren't able to fit it in," says Dalton. "We tried to keep enough mass available on the spacecraft so that there could be room for a lander if someone could come up with a cheap way. Apparently the Russians have stepped up to the plate." He, for one, believes the decision already has been made to head to Europa, and the workshop in Moscow is no coincidence of timing. "There's a bunch of us around here all biting our fingernails trying to figure out what it's going to be," says Dalton. "Two sections of the community of astronomers have been pitted against each other - the ones that want to go to Titan and the ones that that want to go to Europa." "It's unfortunate that there has to be a decision," adds Hand. "It's important to go to both. They are both such amazing and tantalizing worlds in terms of finding life."